Nanobiotechnology applications are defined comprehensively as the creation and use of materials, devices and systems through the manipulation of matter at scales of less than 100 nanometres. Globally, Development of efficient and advance technology, technological advancements and rising interest and uses in various industries are the prime growth drivers of global Nanobiotechnology market. In addition, increase in adoption of Nanobiotechnology for pharmaceutical and semiconductors, and emerging economies such as China, India and others, will create new opportunities for global Nanobiotechnology market. However, higher cost of the research and development, and complex manufacturing process are the key restraints for global Nanobiotechnology market. Geographically North America dominated global Nanobiotechnology market, with approximately half of the world’s procedures being done in the U.S. because of rising nanoparticles used to reinforce tires and other rubber products; photographic silver and dye nanoparticles. Europe is projected to have fastest growth, owing to the favourable growth conditions for pharmaceutical and biotechnology manufacturers due to clinical trial success and eventual Food and Drug Administration (FDA) approval. Among all the applications, neurology segment has the highest market share in global Nanobiotechnology market. This report identifies the global Nanobiotechnology market size in for the year 2014-2016, and forecast of the same for year 2021. 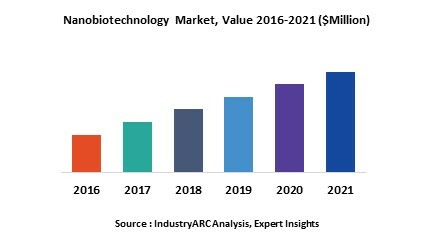 It also highlights the market drivers, restraints, growth indicators, challenges, and other key aspects with respect to global Nanobiotechnology market.